‘Tis the season to be Jolly! It’s also the season to eat drink and be merry! I walk a fine line between loving to party with friends and family and not having any time to do anything. It’s no fun when hosting a party becomes a burden. Over the years, I have discovered some strategies to help keep the fun in the party and leave the stress far behind. Read through to the end to learn how you can win an incredible trip to Napa Valley, California! Quit trying to be perfect! You can have a perfect holiday party even when things go wrong. Focus on your guests and everything will be just fine. Simple food and decor is perfectly acceptable when it is put together with thought. Simple, healthy ingredients are perfect for even the pickiest of party-goers. Write out lists. Write out grocery lists, lists of your favorite recipes, and decor ideas. It is also helpful to have a guest list including phone numbers, addresses, and email addresses. Keep these lists in a holiday binder so that you can refer to them from year to year. Stock Up! Make sure you have plenty of Stella cheeses. Check out all of their different varieties here and you will always be prepared to make this easy Stella Cheese wreath. I love Stellas’s Fontinella cheese for this wreath. You will also want to keep a variety of crackers, fresh fruit, and bottles of wine at the ready so you can easily prepare for a fun evening with friends or family with little effort. Keep it Casual. Formal events are wonderful, but they are a lot of work. Most people I know are just as happy (maybe even happier) with casual events. Casual events are certainly more comfortable for children and parents with small children. Set up a buffet and let everyone fill their plates with their favorites. There is no need to make people feel uncomfortable because of their food preferences. Set up chairs around the room and bring in extra seating if needed. I also like to clear space for mingling. This really helps to keep the conversation going and allows room for toddlers to play with mom and dad nearby. Prepare a Holiday Playlist. A great holiday playlist always keeps me relaxed. Humming along as I set things up sets the mood for a joyous party. Setting the mood is also important for guests. Most parties start out pretty quiet. A great playlist in the background creates fun conversation starters and “hides the quiet” until your guests relax and get the party going. I love the holidays and celebrating with friends and family. I’m also a busy mom. Busy is a constant in my life and the holidays only make things busier. I’m sure you can relate all too well. I don’t let busy stop me from really enjoying the holidays and I don’t want busy to stop you either. Stella Cheeses are a big part of my holiday strategy. It is so delicious and made with good quality ingredients. I know you will love it! I hope you find these tips helpful and you are able to relax and really enjoy the holiday season this year. Purchase Stella Cheese for your upcoming holiday parties and make sure to enter Stella’s amazing contest to win a trip to Napa Valley, California! Check out the details of the contest here. « Is Eating The Wrong Things After Your Workouts Sabotaging Your Progress?? That wreath is so cute! 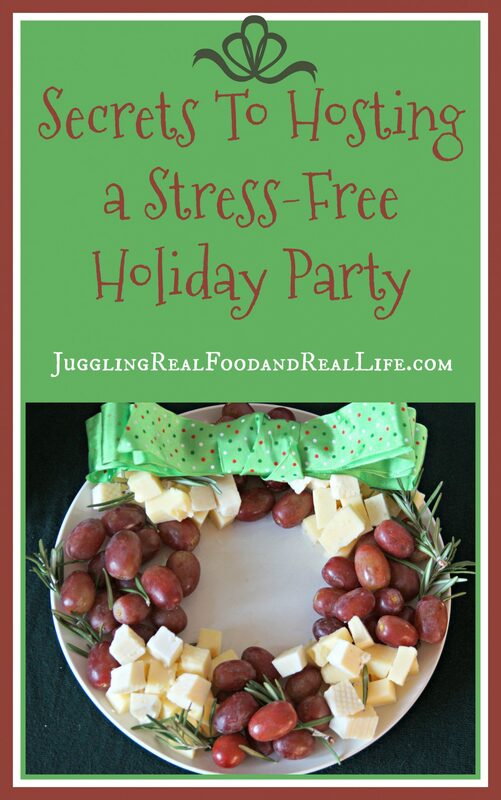 What a great, simple idea for Christmas parties! I’ve heard good things about Stella cheese, too! Thanks Nicole! I took this wreath to a church function and it was a hit! Everyone commented on how cute it was and then the cheese disappeared. 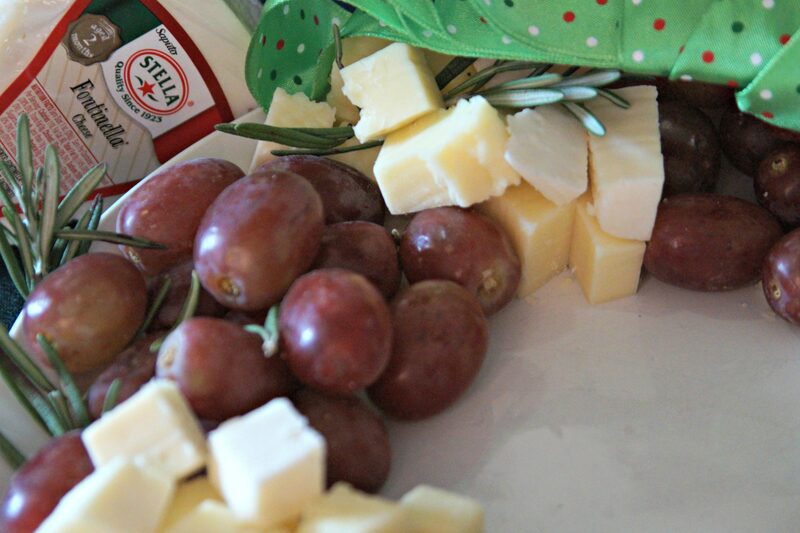 The Stella Fontinella cheese was a perfect combination with the sweet grapes. Hi Christina, I had to let perfectionism go a long ago and am much happier for it. Your tips are right-on so I’ll pin this. Visiting Let’s Get Real Party #130 with Obloggernewbie Zucchini Lasagna That’s Easy, Tasty, and Nutritious. Enjoy the holidays and remember to pace yourself. Thanks for hosting such a great party! Perfectionism is certainly overrated. I do try hard to make things nice, but letting go of perfection helps me to keep my sanity during this busy time of year. Your zucchini lasagna looks great. I’m always looking for new delicious and easy recipes to try. Thanks for linking it up for us.